I've bought a baguette and had it turn rock hard more times than I'd like to admit. As someone who hates waste, it killed me throwing them out. And since you all seem to love my bacon hack so much, I thought you might get some use out of this simple kitchen hack too. The way I see it is you have two options... resurrect this sucker and make it soft and edible again OR turn it into bread crumbs. The latter might seem more obvious to some of you. I realized I could do this when I accidentally dropped an english muffin INTO my kitchen sink while cutting it, UGH. It dunked right into a half filled water glass from the night before. While I can't believe I'm admitting this to you, being the waste hater that I am, I pulled it out, gave it a few good shakes to get off as much of the water as I could and I threw that sucker into the toaster anyway. I mean... it's not like it went into gross soapy or germy sink contamination. It dropped into my water glass from the night before. Anyway, to my surprise, the english muffin was great and extra fluffy. So the next time my store bought baguette went hard on me, I ran it through the faucet and threw it into some aluminum foil and into a 350º F oven it went. 10 minutes later my baguette came back to life - GENIUS! I find depending on how far gone your baguette is, you may need more or less water - you'll get the sense of it after a few tries. Most of the time if you take some paper towel and completely soak it in water and then lightly ring it out, wrap it around the baguette and completely cover it in aluminum foil, it should do the trick. 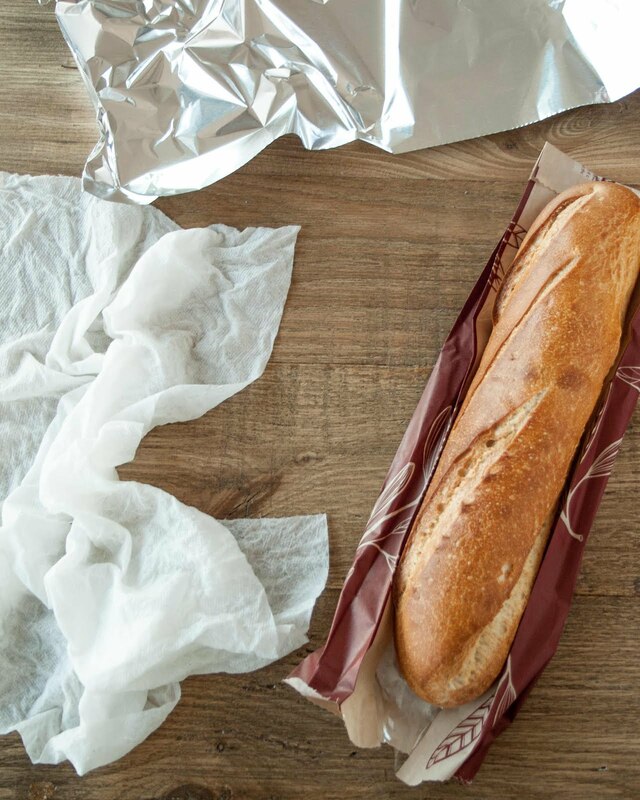 You have to make sure you completely seal the foil around the bread because it turns into a little sauna for the baguette. Basically you're schvitzing the bread back to life. The paper towel is optional. If you don't do that method, you can simply put a few good splashes of water onto the baguette and put it into the aluminum foil by itself (no paper towel). Usually I'll cup my hand under the running faucet, let most of the water run off and splash the baguette by flicking my fingers at it in the foil. Then seal it up nice and tight. Sometimes the bread will stick to the paper towel or the aluminum foil in a few places - don't panic, just pull it off. And if you add too much water, sometimes the bread can get a little rubbery in the oven. If that's the case, just pop it into the oven uncovered for a few minutes to dry up some of the moisture you added in. If you don't want to heat up your oven, you can do a similar treatment in the microwave (sans foil). I find the microwave alters the texture of the bread a bit - it becomes a little rubbery. But hey, it works in a pinch! 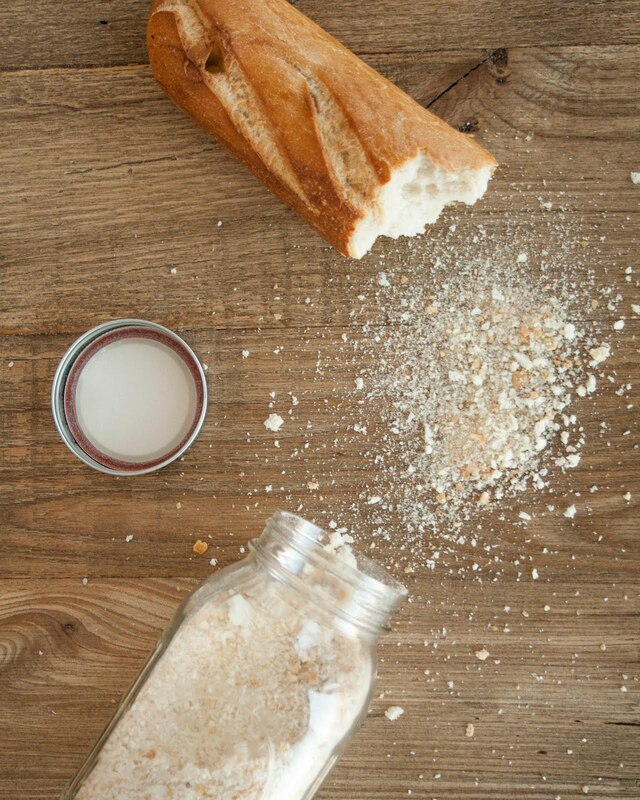 To make homemade bread crumbs, hack your baguette into manageable pieces for your food processor. I found 2-3" chunks were fine. It doesn't have to be perfect, just saw it/break it any way you can. Crumbs will go flying but they're easy to clean up. Give the bread chunks a few good pulses until the crumbs are the size you like. If you find that your bread is still a little soft inside (ie not 100% dried out) that's ok. You can pour your crumbs into a 350º F oven and toast them a few minutes until they're fully dry. If you find your food processor is struggling because that sucker is DRIED OUT, don't fear. Try to help your food processor out a little bit by cutting it into smaller pieces. It will eventually turn to bread crumbs. If you want to get fancy, you can season your breadcrumbs in any way you like. I prefer putting them plain, in an air tight container so that you can use them in a number of dishes - sweet or savory. Do you have any other great kitchen hacks or tricks? Leave them in the comments below. I'd love to hear from you! Waste not want not, amiright?! Saving baguettes has been always a very difficult task as it doesn't remain fresh for he long.Now I am happy to know the proper way of saving it.